Does Mixing Lemon Juice in Your Conditioner Make Your Hair Blonder? 1 What Does Lemon Juice Do to Your Hair? The combination of lemon juice and UV rays can cause hair to lighten. If you mix lemon juice into your conditioner on a daily basis and rinse it out, you will notice only gradual lightening effects at best. For a more noticeable look, fill a spray bottle with lemon juice and mist it onto damp hair, then sit in direct sunlight. This process is a natural alternative to harsh chemical dyes or treatments. Cosmopolitan notes that applying lemon juice, which is a citric acid, to hair and then heating with the UV rays of the sun causes hair cuticles to open and pigments to be lifted out. Sit outside in direct sunlight -- be sure to take proper precautions with your skin -- for 30 to 40 minutes. Rinse the juice out of your hair and condition thoroughly. Both the acid and the sun's UV rays can do some serious damage to your hair, so repeat this process no more than once a week. While mixing lemon juice in your conditioner may not be an efficient lightening treatment, it may produce other beneficial effects. Lemon juice is a natural remedy for dandruff when mixed with olive oil. Because of its drying properties, it may be a cure for oily roots and hair. Lemon juice may also reduce dullness and restore shine. 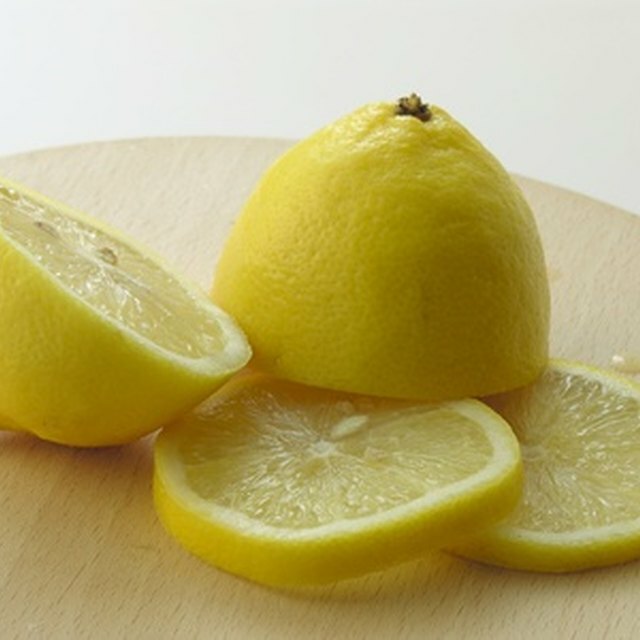 As with all lightening treatments, the lemon juice process is best suited to blondes. If you have naturally dark hair and you attempt to go blonde using this technique, you may not like the results. The citric acid can cause brown, black or red hair to turn orange. Speak to your hairstylist before attempting any at-home lightening. Additionally, it is not wise to swim in a chlorine-treated pool after applying lemon juice to hair. The chemical reaction may cause the hair to take on a greenish hue. Honey and chamomile tea can also be applied and dried in the sun to lighten hair. Chamomile is generally regarded to be a safer alternative for brunettes. Its effects are more gradual, so it may require more applications. Directly applying honey to the hair can be a sticky mess, so mix it with equal parts lemon juice and warm water. In addition to lightening dark blonde to light brown hair, honey also makes the hair shiny and bouncy.